A Persian rug – whether it hangs on your wall of your apartment or lies on your floor with its threads betwixt your toes – is steeped in history. Persian-inspired or replica, even the cheaper substitutes are composed designs and patterns reminiscent of those used by ancient Persian weavers. In modern times, Persian is a nod to a rug’s style and layout, not specifically where it was made. Since the expansion of the Moghul Empire, most modern Persian rugs are made in Iran (new Persia), Pakistan and India. While Persian rugs are considered to be the quintessential Oriental rug, there are multiple other types of knotted rugs that may become confused with the Persian archetypes. Popular Pakistani styles Bokhara and Tribal traditionally feature geometric patterns while Persian rugs are famed for their intricacy, broad colour pallet and symbolism. 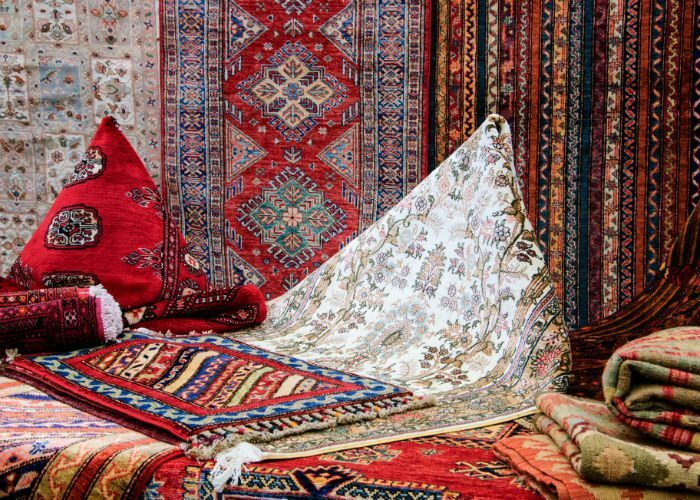 If you’re lucky enough to own an original Persian rug then you’ll be aware of its value and you may decide to protect it with home contents insurance. They are almost incomparable for adding grandeur and depth to a room. While your original Persian rug requires very little maintenance, it’s important to take care of it. The threads are the beginning of a rich historical tapestry. Carpet weaving is a still a major part of modern Iranian culture and is the country’s main exports. The patterns on your rug will be the same ones that covered the floors of ancient Persian palaces – or contemporised versions of these originals. The Iran Carpet Company, today’s specialists on how the now related to the then, have categorised the layouts and designs into main and sub patterns. You might just share something with a Persian Prince if your rug or carpet features the boteh jegheh pattern. This kidney-shaped Iranian design is a Zoroastrian symbol of life and eternity, originating in 200-650 AD. It was used to decorate court garments, crowns and other royal regalia. You may notice that the design has since been adopted by Scotland and is featured on paisley shawls. Probably the most distinctive pattern used on Persian rugs, the mina-khani made up of interlinked daisies and is usually used all-over. The mina-khani is often teamed with a bird of paradise design. Birds often symbolise independence, freedom from constraint and joy. The rosette features on the corner of Persian rugs in many different colours and sizes. It holds particular religious significance as it is believed by some to represent the Star of Bethlehem. If you’re on the lookout for an original Persian rug, a good place to start is a reputable outlet. You may want to try Little Persia, The Persian Carpet Studio or The Oriental Rug Shop. Or, if you need a little inspiration kick-start, then Pinterest is a great place to start.